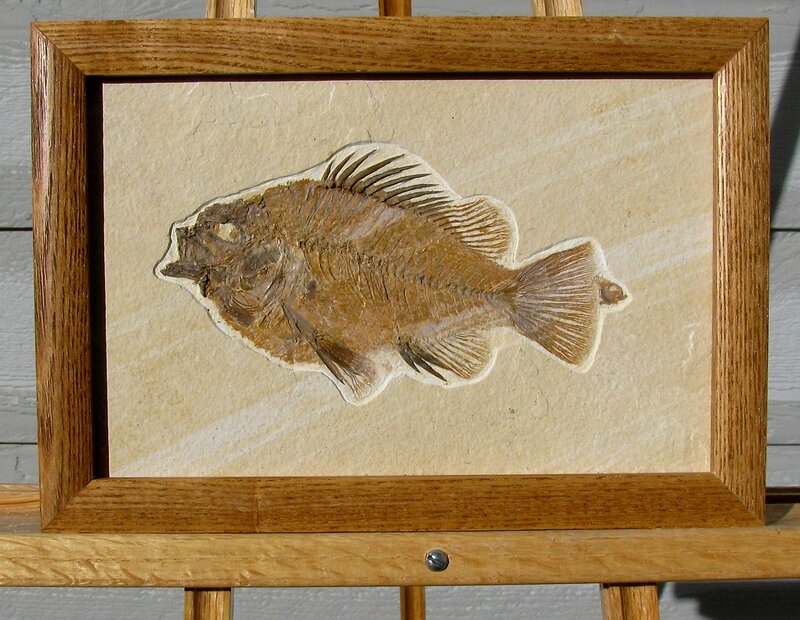 Size: Fish is 6.7" long, frame is 7.8" X 11.2"
This is a fabulous fossil fish. 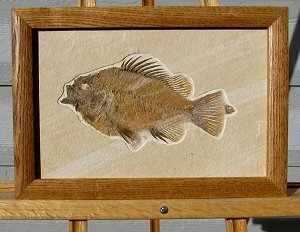 It is a large Priscacara serrata from the Green River Formation of Wyoming. This classic type is very sought-after because of its recognizable look - similar to a modern-day Bluegill or Crappie. This fossil was extracted under a microscope to reveal the extremely fine detail. The textbook large dorsal fin is beautifully displayed on this specimen. The other fins, backbone, tail, and other bones are all well showcased and very easily seen. And the plate has even been professionally framed! But the coolest feature of this fossil is that a small Diplomystus fish seems to be hiding under the Priscacara's tail! You can see him peeking out in the last close-up photo! This is an excellent display example of a Priscacara fossil fish, hiding his little buddy!